To ensure the European sovereign debt crisis doesn’t go to waste, the markets have kept policy makers and bankers on their toes. The naysayers of a European turnaround have become so overwhelming that it is stunning Europe hasn’t submerged into the Atlantic Ocean yet. It appears that German Chancellor Angela Merkel, the cautious woman with the checkbook, is about to turn the tide. First off, Greece would likely default, possibly within weeks, if it were not for the efforts being made to postpone the inevitable until next spring. 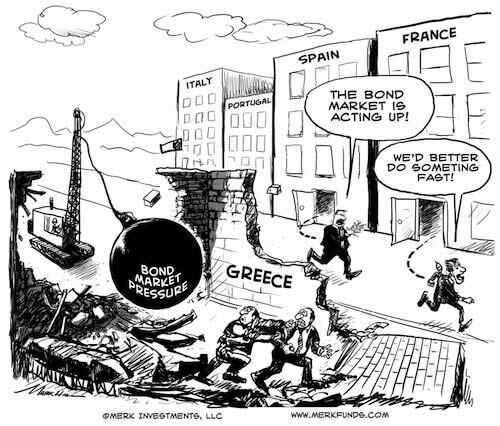 The driving force behind the Greek drama and its potential fallout has primarily been played out in the bond markets. Indeed, it appears the only language policy makers understand is that of the bond market. In this context, it’s quite astonishing how much progress has been made. Italy, for example, passed substantial reforms three times this year. And for those who worry that the politics of austerity measures may topple governments, and thus the reform process itself, fear not: in Spain, for example, early elections in November will likely have the current opposition sweep to power. The main implication in Spain will be that the new government will own the same old problem, but may have a stronger majority to engage in reform. In Germany, where many fear the junior coalition partner will at some point cause the government to collapse, note that the major opposition parties favor Eurobonds and possibly a Marshall Plan for Greece; both such plans would likely appease bond markets. When it comes to banks, it’s again the market calling the shots. While banks had ample opportunity to bolster their balance sheets – and in all fairness some have done so – bank boards have been hiding behind their regulators. Bank regulation is deeply flawed, as it favors holding domestic sovereign debt and discourages marking positions to market. In Europe, a strong pan-European regulator is urgently needed to put a meaningful dent into this culture. Fear not: the markets haven’t waited for regulators to get their act together. The latest round of European stress tests was most meaningful, because it provided transparency on the sovereign debt exposures of European banks. As a result, the market provided “encouragement” to weak banks to raise more capital. In a strange way, that process has been working wonderfully, culminating in German chancellor Merkel throwing her weight – and checkbook – behind the initiative. Although the debate should be playing out mostly in the spreads in the bond markets, i.e. the difference between the cost of borrowing between the stronger and weaker Eurozone countries (with respect to banks, both their debt portfolio and stock market valuations have been guides in assessing their perceived health), the Euro tends to also be the focus of attention. As the Euro was plummeting towards 1.18 versus the U.S. dollar in 2010, we became outspoken ‘euro bulls’, arguing that issues in the Eurozone should primarily be reflected in the spreads in the bond market; the Euro was sold – in our view – mostly because of its great liquidity: it’s easier to sell the Euro rather than short peripheral country bonds. Indeed, the Euro since recovered substantially, while periphery nation spreads have widened. Market volatility is the friend of strong hands. Momentum players are attracted by a market that goes up (or down) in what approximates a straight line, be that the stock market, gold, the Swiss franc or euro. When such a trade is no longer perceived to be risk free, volatility returns to the market; those trend chasers run for the exit, often causing sharp corrections. Volatile markets force investors to think for themselves: is blood on the streets a unique opportunity for the contrarian investor or an omen for even more extreme conditions? Just about a month ago, we turned cautious on the euro, as the tail risks became evermore likely to unfold. However, in a world where policy makers are throwing billions and trillions at the problems, market fundamentals can quickly change. And so it is that our assessment of the likely outcome for the euro has changed. Last Wednesday, Olli Rehn, EU commissioner on monetary affairs, suggested bank recapitalizations ought to take a high priority. When the woman with the checkbook echoed his assessment, we decided that major progress had been made. German chancellor Angela Merkel has come to the realization that bolstering bank balance sheets may be the most effective way to build the “ring of fire” around Greece’s impending default. Over the weekend, French President Sarkozy has fallen in line with Merkel’s new agenda; unlike the German Chancellor, Sarkozy wants to rely on the European Financial Stability Facility (EFSF) as a primary, rather than last, resort; his different perspective is not surprising given the substantial exposure of the French banking system to Greece. In 2008, the infamous TARP program put in place to rescue the U.S. financial system opted to inject money into the banking system rather than buy “toxic assets.” As politically painful as it may seem to “bail out the banks”, this is where capital is most effectively deployed, for the very simple reason that banks can leverage the capital. A Euro spent on buying Italian debt is a Euro spent; a Euro injected into a bank can support ten times as much capital, or more. We are not advocating to increase bank leverage, but to regain market confidence, banks must have adequate cushions to allow for “haircuts” of debt held by the banks; in the case of U.S. banks, it was mortgage backed securities, amongst others; in Europe, it’s sovereign debt holdings of “peripheral” Eurozone countries. After the current short squeeze in the Euro has run its course, investors may be surprised to see the rally continue on the backdrop of more positive scenarios being priced into the markets. Ironically, the biggest risk to a positive outcome is market complacency. As soon as market pressures abate, policy makers tend to lose their enthusiasm to make tough decisions. Fortunately, there are plenty of minefields along the way, ensuring that policy makers should remain on alert. Axel Merk, President & CIO of Merk Investments, LLC, is an expert on hard money, macro trends and international investing. He is considered an authority on currencies. Axel Merk wrote the book on Sustainable Wealth; order your copy today. The Merk Absolute Return Currency Fund seeks to generate positive absolute returns by investing in currencies. The Fund is a pure-play on currencies, aiming to profit regardless of the direction of the U.S. dollar or traditional asset classes. The Merk Asian Currency Fund seeks to profit from a rise in Asian currencies versus the U.S. dollar. The Fund typically invests in a basket of Asian currencies that may include, but are not limited to, the currencies of China, Hong Kong, Japan, India, Indonesia, Malaysia, the Philippines, Singapore, South Korea, Taiwan and Thailand. The Merk Hard Currency Fund seeks to profit from a rise in hard currencies versus the U.S. dollar. Hard currencies are currencies backed by sound monetary policy; sound monetary policy focuses on price stability. The Funds may be appropriate for you if you are pursuing a long-term goal with a currency component to your portfolio; are willing to tolerate the risks associated with investments in foreign currencies; or are looking for a way to potentially mitigate downside risk in or profit from a secular bear market. For more information on the Funds and to download a prospectus, please visit www.merkfunds.com. Investors should consider the investment objectives, risks and charges and expenses of the Merk Funds carefully before investing. This and other information is in the prospectus, a copy of which may be obtained by visiting the Funds' website at www.merkfunds.com or calling 866-MERK FUND. Please read the prospectus carefully before you invest. The Funds primarily invest in foreign currencies and as such, changes in currency exchange rates will affect the value of what the Funds own and the price of the Funds' shares. Investing in foreign instruments bears a greater risk than investing in domestic instruments for reasons such as volatility of currency exchange rates and, in some cases, limited geographic focus, political and economic instability, and relatively illiquid markets. The Funds are subject to interest rate risk which is the risk that debt securities in the Funds' portfolio will decline in value because of increases in market interest rates. The Funds may also invest in derivative securities which can be volatile and involve various types and degrees of risk. As a non-diversified fund, the Merk Hard Currency Fund will be subject to more investment risk and potential for volatility than a diversified fund because its portfolio may, at times, focus on a limited number of issuers. For a more complete discussion of these and other Fund risks please refer to the Funds' prospectuses. This report was prepared by Merk Investments LLC, and reflects the current opinion of the authors. It is based upon sources and data believed to be accurate and reliable. Opinions and forward-looking statements expressed are subject to change without notice. This information does not constitute investment advice. Foreside Fund Services, LLC, distributor.